Matthew pointed out that I have been spelling Hop Vine two ways: Hopvine as one word, and Hop Vine as two words. This is because I have seen it written both ways, and personally I don’t have a strong preference. Perhaps I should be more consistent, but I don’t have good criteria for choosing between the two spellings. Without good criteria, some decisions just can’t be made. INTP anyone? 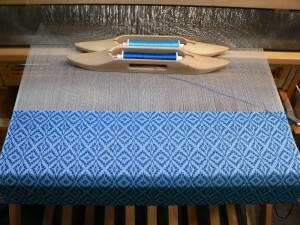 Meanwhile, here are three more pieces that I’ve woven on this warp. I re-wrote the treadling to maintain a consistent tabby order, so the pattern looks a little different from my earlier woad- and madder-dyed pieces. All the yarns in this group are commercially dyed. Back at the beginning of September I was surprised to discover that tons of flax seeds which I’d dumped out of a retting tank in the back yard had managed to germinate, despite having been waterlogged and fermented, and still being in their pods. You can read my original post here.